The best kind of review is the one you don't have to give. I 100% agree with the below quoted review. (I even use the exact same technique with a zip tie, but I use a reusable zip tie.) 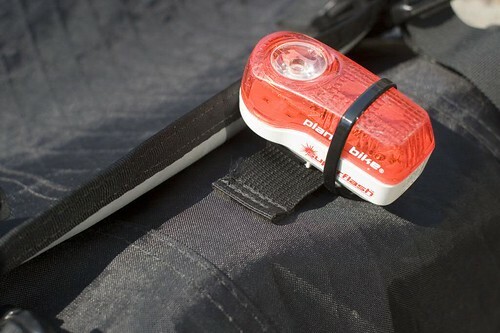 The Planet bike Superflash (Serfas also makes an identical version) is the single most important piece of saftey equipment money can buy for cycling besides a helmet, and it's only $20. The brightness of it's primary LED makes all the difference in the world, the price tag makes it a given. If you commute, this is a must have. The bottom line is cars will behave differently when you use it. I think it's simply because the light is so bright they actualy register you. No more brain dead drivers flying buy at 55+ mph inches away. Or maybe they even think you're a cop or construction workers or something. I don't know what they think, but it works. Do you have one of these? If not, you need to go straight out and get one - they're about 20-bucks US and are unequaled in the battery operated arena of rear lights. This thing uses a single 1/2 watt LED, backed up with 2 smaller LED's that more than adequately keep you visible to passing cars - not just at night but during daylight hours as well. Cons to this light? Well, a few times I've had this light fall off my bag, usually with the light arranging itself into its white back, clear red lens, and its 2-AAA batteries rolling around underneath a dumpster or another undesirable location. Fix you say? Simple, take a zip-tie and wrap it around the light such that it grabs onto the back clip - two benefits to this; 1) light doesn't fall apart and 2) light is 'locked' to your bag or quick-attach mount. If you don't use this zip-tie method, people may possibly ridicule you and laugh when you roll by - don't take that chance. Recharge the batteries when the light fades - this light will continue to function under a reduced battery level but at a much lower light output. Put fresh batteries in this gal and you'll notice the difference immediately. My advice - go get at least one of these lights. Even better, put one on your bag and one on your seatpost or seatstay. A few close friends have received this light as a gift from me - I believe it to be the best out there. One last point. In winter lithium ion batteries last infinitely longer then regular batteries or rechargeables. Rechargeables are particularly suseptible to cold. In the summer any battery will last virtually forever.